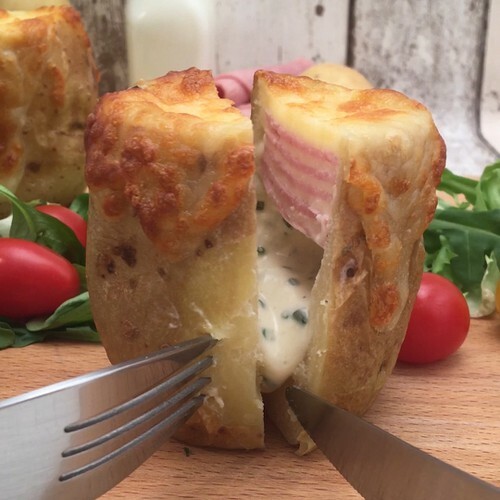 Cut the bottom off the potatoes and place them on end in a muffin tin, brush with melted butter, and bake in the oven at 180°C for 25 minutes. Make layers of ham and cheese, then use a small glass to cut circles of ham and cheese. Add chopped chives to the crème fraiche or sour cream, and sprinkle with salt and pepper. Cut the top of the potatoes and scoop out the flesh, then fill with a spoon of the cream mix. Then add the layers of ham and cheese. Finally top with grated mozzarella and bake in the oven again for 10 minutes at 180°C. Serve straight away.